No longer do you need to buy a complete control arm bushing set just to get two bushings when swapping out your stock control arms with the stronger tubular type arms. 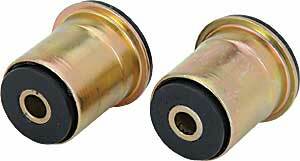 These hard durometer graphite impregnated urethane bushings provide maximum control and minimal deflection. Does JEGS 60525 fit your vehicle? 60525 is rated 4.3 out of 5 by 3. Rated 5 out of 5 by valleyson 69 from Very nice bushings We had tried to find these bushings locally but, when we did, they would always be to big. When ordering these from Jeg's, we expected to have the same problem once they arrived. To our surprise, they fit perfectly. Rated 4 out of 5 by Shot caller from Good stuff ! Ive , bin buying parts from Jegs for many years, im alway's telling my friends about Jegs. thanks !